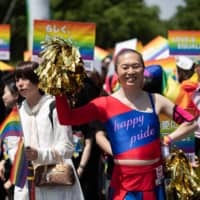 Nobody appears to object as you step onto the covered elevator that ascends to the fourth floor of the Canadian Embassy in Tokyo’s well-heeled Aoyama-Itchome district. 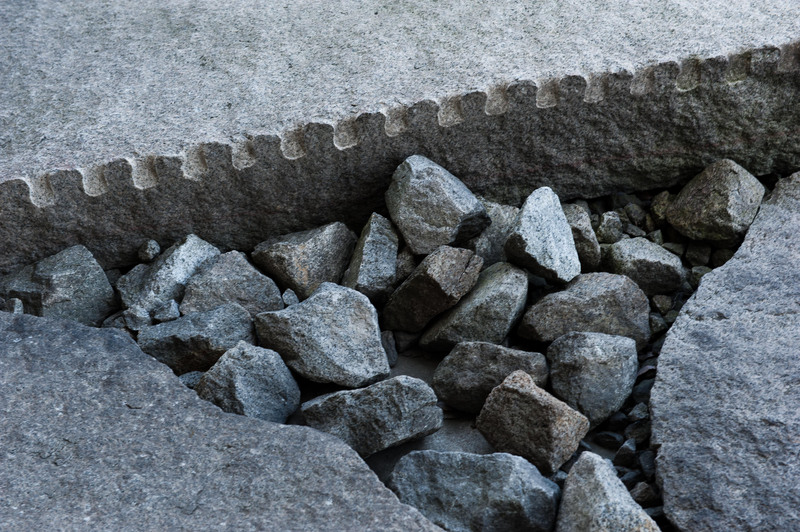 Formalities are waived for the occasional visitor coming to see one of Japan’s finest and most daring contemporary stone gardens. 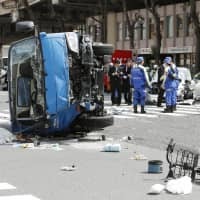 However, the improbability of the location, facing the embassy’s reception area high above the traffic of the city-center Aoyama-dori Avenue, adds to the intrigue of the garden. Its designer, Shunmyo Masuno, head priest of a Zen temple in Yokohama, is arguably the only Buddhist cleric still practicing garden design in the tradition of the original, itinerant ishi-tate-so (stone-setting priests) of whom there were famously many during the time of the Kamakura Shogunate (1192-1333). 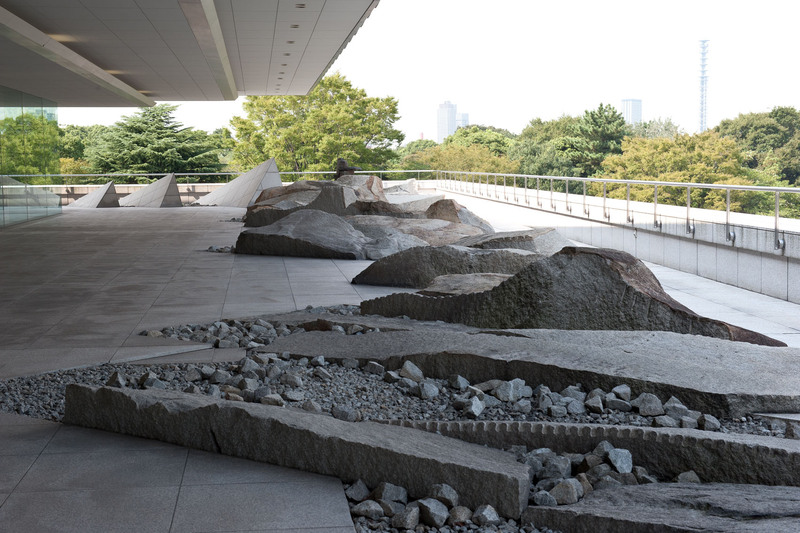 In this 1991 masterpiece, Masuno has used stones from the Hiroshima region to represent the geological character of the ancient, glacially worn bedrock that forms the Canadian Shield extending across much of the east of the country up to the Arctic Ocean. The symbolism is meant to embody the principle of harmony through friendship between the two countries, while the primal ruggedness of the Canadian terrain is suggested in the rough cutting of the stone, in which lines of holes into which wedges were hammered to split the rocks have deliberately been left exposed. The far corner of the garden forms a right-angle at an inukshuk, a stone cairn used by the Inuit people of the North as a symbolic marker. The Rocky Mountains, which border the Shield’s western edge, materialize in three pyramid-shaped blocks along one side of the garden. 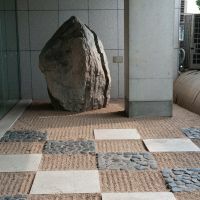 Symbolism like this has long been used to add depth and interest to Japanese gardens, and, through an unfolding of associations, to expand the spatial aspects of the mind. The abundance of space with which Canada is blessed has also been cleverly inducted into the garden, creating a powerful impact on visitors. 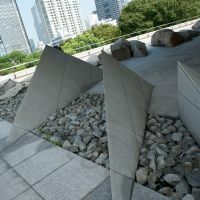 The stark monotone elements of the garden have been developed by using geometrically precise floor tiles to connect the landscape to the glass and concrete of the modern building. Several of the larger stones were cut to scale, and then hollowed out to reduce their weight. 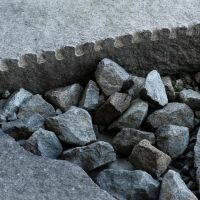 Among Japan’s gardening fraternity, such measures are highly contentious, since purists maintain that rocks should never be cut. However, given the structural issues and the problematic weight of the stones used here, the deception has been vindicated. 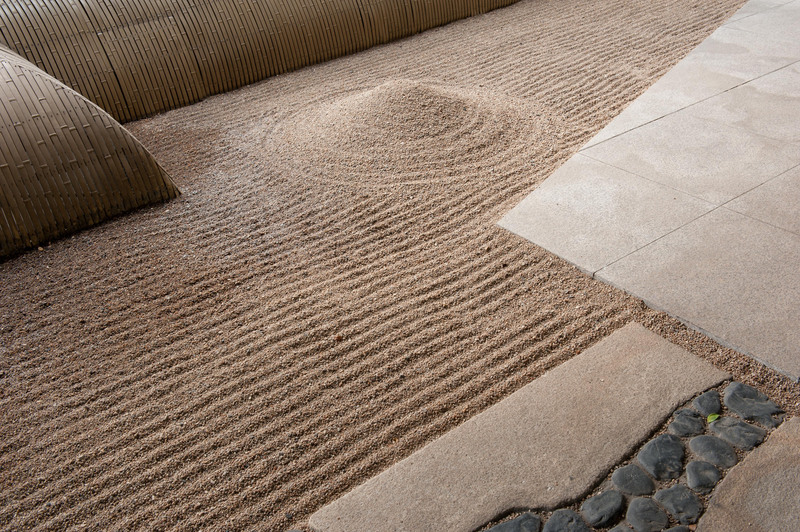 Visual illusion has, in fact, always been an important element in Japanese garden design. Indeed, I had never quite understood British painter David Hockney’s remark, “Surface is an illusion, but so is depth” — never, that was, until I stepped into the world of the Japanese garden. The classic example of the manipulation of perspective, perhaps, is the use of large stones for foreground, with smaller rocks placed toward the far end of a garden. This technique tricks the viewer into assuming the landscape has greater depth than it actually has. 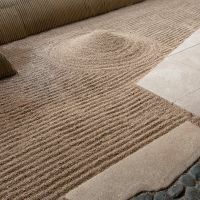 Another technique of sensory manipulation, shakkei — the “borrowed view” concept — allows distant hills, mountains and even buildings such as temple roofs to be co-opted into a garden’s design. 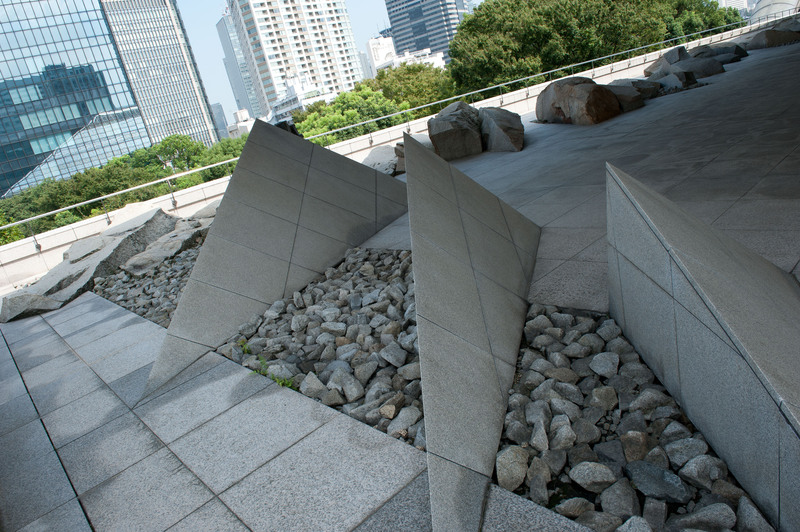 Here, in the case of the Canadian Embassy garden, this technique takes on an interesting twist as the dry surfaces and irregular forms of apartment blocks, offices and skyscrapers become the “borrowed” scenery of this modern, urban garden. The elevated terrace of the embassy further benefits from the requisitioning of some natural, unbuilt features — most notably the seasonally changing foliage found in the spacious grounds of Akasaka Palace and, on another side, trees in the adjoining Takahashi Memorial Gardens. Consequently, to stand on a granite spit above a pool of water built into the side portion of the garden and gaze over the treetops of the palace grounds is to feel a pleasant sense of corporeal detachment — of being suspended in space between city and sky. The role of regenerative gardens such as this, stilling the nerves and providing repose from the pressures of modern life, has never been more important. In urban settings like that of central Tokyo, with its spatial confinements, lack of greenery and islands of trapped heat, modular and conceptual gardens offer us the gift of renewal. 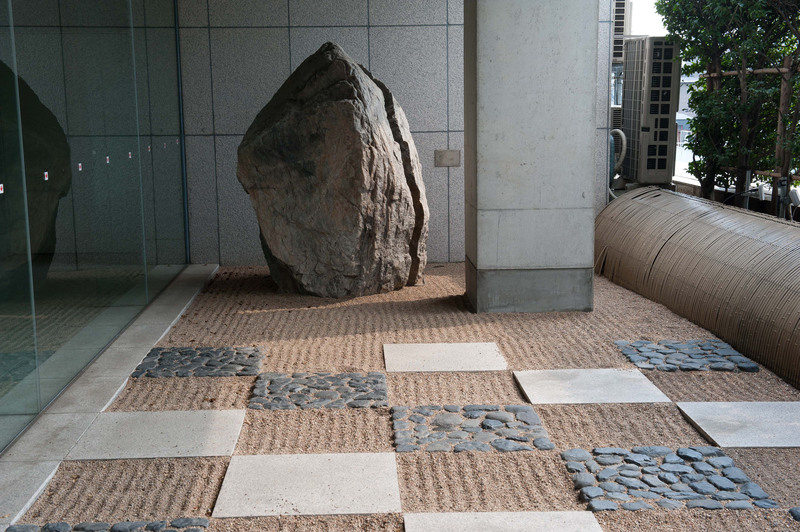 In many respects, Japanese stone gardens are singularly well suited to these urban settings, where interminable expanses of concrete, stone and glass recall the bleakness of mountain ranges depleted of plants and greenery. In such undernourished environments, with pollution and intrusive buildings blocking access to sunshine, the prospect of growing healthy plants can be daunting. Fortunately, this is not a problem the designer of dry landscape gardens is obliged to consider. Getting there: The Canadian Embassy is a 3-minute walk from Aoyama-Itchome Station on the Ginza, Toei Oedo and Hanzomon subway lines. The garden is open Mon.-Fri., 9 a.m.-5:30 p.m. Admission is free. Stephen Mansfield’s new book, “Japan’s Master Gardens: Lessons in Space and Environment,” will be published in January.